Welcome back everyone to the e-commerce marketing podcast. I am your host Arlen Robinson. And I have a very special guest today. 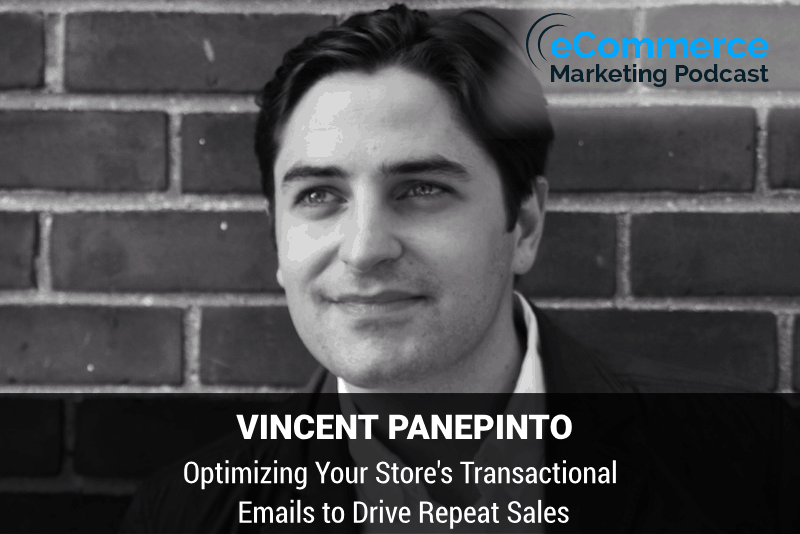 His name is Vincent Panepinto and he is an entrepreneur and email marketing expert. He is a co-founder of Spently. Spently's Shopify App helps merchants turn transactional emails into marketing opportunities with upsells, discounts and follow-up emails after every purchase. Welcome to the podcast Vincent. Hey, thanks for having me Arlen. Yeah, not a problem. Great. Having you here. We always get a diverse group of guests before we kind of get into the marketing strategy that you're going to tell us about. Why don't you give me a little bit of background in our audience a little bit of background on how you got started. I know you're the co-founder there at Spently, so Let us know a little bit about your company and what you did before. Sure. Yeah, it's quite a long story. I mean, I've always kind of considered myself to be an entrepreneur after doing my bachelor's degree my co-founder and I decided to pursue some some more business education. So we did a post-grad in global business management. And while we were doing our post-grad we were sort of formulating a business plan and we've actually pivoted. Quite a bit since the initial business plan, but it led us down the path to what's been Lee is today and actually initially believe it or not. We wanted to eliminate the paper receipt for brick-and-mortar retailers for one, you know, we saw that thermal thermal. Paper that receipts are printed on was non-recyclable and brick and mortar retailers were spending a lot of money on these thermal thermal paper rolls. And the next thing was we said, hey, this is you know, sort of a great opportunity for customer engagement and a great opportunity to capture email addresses by sending a digital receipt instead of a paper receipt, you know, at the time this was probably six or seven years ago. It was probably early for the market. We had a friend on Shopify who had a Shopify store and he said to uh, you know, your ideas great, you know, we were trying to pursue sort of Tier 1 and Enterprise retailers with the solution and POS companies all over the world, but we had this friend on Shopify and he said, you know, there's nothing like this on Shopify. We send email receipts every day. We don't have to print them where eCommerce not not brick and mortar, but there's no way for. To use this email receipt as a way to upsell customers and we'd love to see this type of solution on Shopify. So we said at the time, you know, what will bring bring the app over to Shopify and it'll be sort of our sandbox testing area and after about a year of testing on Shopify, we realized that the solution was actually much better fitted for the small to medium-sized business owner on Shopify than the Enterprise which we may revisit at some point. You know, that's kind of how we got started and you know, we've been helping retailers and online Merchants sell more through their email receipt and a suite of other transactional emails. We discovered afterwards action. Gotcha. Yeah. That's awesome. A lot of times when I'm talkin to guest. I hear story where they've got started One Direction and it kind of based on, you know, some of the things that they encounter people that they talked to they end up going down a different direction and it kind of sounds like you. You guys pivot into the to the digital space really kind of made sense and it's you know, really right on time, you know, personally, I think the the regular paper receipts at some point. I think that's going to go away. I think you know, like you said eventually everything really probably will just go digital and you know, those things will no longer just be printed everything will be you know, just sent to you or maybe even the credit card companies will have your email tied on file and it'll just automatically go so I can. That coming pretty soon. Sure. Yeah. I mean, I obviously I love eCommerce because I get that digital record and then whenever I'm in a store and I buy something and get a physical receipt and if I happen to need that receipt for some reason, I I scan it or take a picture of it immediately and I throw the paper out. So, you know, it's an important document for customers and we'll get more into that later. But uh and why it's important and what how we can use that to our advantage. Yeah. That's the thinking behind it. Sure. That's awesome. So as far as digital e-commerce transactions are concerned, of course, that's your bread and butter why why are transactional emails, you know, so important these days I guess compared to other emails. Yeah, so I just wanted to sort of make a distinction here because because I speak to a lot of merchants every day. A lot of merchants don't even really know what transactional emails are and when they think about email marketing they tend to think of email newsletters only. So, you know an email newsletter is what I would call a bulk email. So the idea is it's one too many you have one message and it goes out to many people at one time generally speaking. So you may blast out to you know, 20,000 or 100,000 people and they all get the same newsletter message when you. Side to send it, you know, there's also email automation which is you know, sort of predetermined flows and things like that to follow up with customers automatically and then there's transactional email. So what transactional email is there sort of emails that are triggered by customer interactions with your store. So when a customer makes a purchase. That triggers an order confirmation email when you fulfill an item and ship it that will trigger a shipping confirmation email. If someone registers for for an account with your website, you know, they may get an account activation or an account welcome email and you know, even something as simple as a password reset the customer has requested to reset their password. They get a password reset email. So they're really based on these sort of customer interactions and the reason why they're so important. Of all they communicate important information that the customer needs and there's also context as to why they're receiving that email and because of these two things they are opened at a far greater rate than any other email you can possibly send your customer. So, you know, it's not unusual for us to see unique open rates. Well over 80% total open rates over two and three hundred percent because people. Check their order or they're shipping email two or three times or because you know, they want to see if they were charged correctly or they want to see if their items on the way check the tracking. So they're basically the, you know, the most important and certainly most opened email you can send compared to an email newsletter which gets opened around, you know, typically 20 percent of the time. So, you know, our thinking is is these emails do serve this very functional purpose of communicating. Important information from a merchant to a customer but if we take a look at these emails, we could actually add things like branding marketing content to them that actually help you drive more repeat purchases and and repeat business. And so that's really really what we discovered. It's a super super effective way to drive that next purchase. Yeah, that's definitely true. And I was thinking about what you said as far as the open radon. Being upwards of 80% on those types of emails and they definitely make sense because I can think about for my own experiences whenever I order something, you know, I could have an inbox of you know, 50 to 100 messages and you know some of those I need to get through some of them could be pretty important. But if I see those transactional emails from something I purchased that I'm probably gonna go to that first, you know, I'm gonna make sure like, you said, okay make sure did I would have the right amount that I wrote it right product was Ira's attract. Information do they have any order details as far as tracking or you know when I'll be able to receive it, you know things like that. So I sure did we make sense and I can see that from you know, my own personal. Yeah. The other thing is that that email is for you. It's for Arlen. It's not you know, a newsletter nothing wrong with newsletters. There's certainly a time and a place for them and they're helpful but and effective but you know that newsletter is to thousands of people potentially right? Where is the information? In the in the order confirmation receipt is, you know specialized in personalized to you right for sure. So, you know, if there's of course an e-commerce business listening and they you know, something is kind of sparked an interest in them and they're saying okay that doesn't make sense. You know, what do you say are some of the best were main ways that a business can optimize their email transactional emails to you know, take advantage of that open rate, but yet at the same time. No, not not overdo. It don't you know provide them with too much or what your opinion and what are some of the ways you think they can kind of take a stab initially at optimizing those emails one, you know, I'll get into you know, first of all, they should be using them to drive revenue and I'll get into that but another thing is just simply customer experience a lot of merchants make the mistake of you know, driving a purchase and thinking that their job has has been done so they put a lot of time and effort into design. A great website and customer experience and then the purchase is made and the customer experience drops off and people are getting a plain text or very plain and boring order and shipping emails. So if you can take your brand colors accent colors logo any lifestyle images to carry that customer experience and continue it post-purchase. I mean, that's that that's a no-brainer. In terms of actually using the emails to drive results. There's a number of ways to do that one is by making product recommendations and that's something we offer at spent. So we actually look at what the consumer purchased and say you may also be interested in this item or that item and this is something that Amazon has has been doing for years very successfully. Successfully and and there's no reason why other Merchants shouldn't be doing it as well. So that's an easy one. Another one could be you know unique or personalized discount codes with an expiry date that says hey, you know, thanks for shopping with us. Here's a discount code for 10% off your next purchase within two weeks. You know, someone just bought something they are way more likely to buy again. Once they have bought something and another one that I think, you know quite well about. Arlen is is referrals. Can you put a referral program or something in that email to get them to share that discount or savings with their family and friends or so. Those are just a few ideas? Yeah, definitely and with the referral aspect of it, that's something that we communicate with our customers all the time as a strategy to promote their program. I've even given several webinars where I highlight that that particular aspect of promoting the referral program. Because you know, you don't even have to do anything fancy. If you've got a referral program in those transactional emails. You can just have a kind of a soft offer a link to say, you know for refer your friends or sign up to refer your friends and or whatever it is or in 20% commission or earn discount towards future purchases. Whatever the offer is some really easy to do, you know within just a couple of a couple lines of text you can easily put that there and just. Of the fact that those emails are getting the super high open rate death. Yeah take it and give them give them the ability to share via email Facebook Twitter. However, they want to share that referral and just going back to that stuff. You know, it's not just about driving the that first purchase. It's about driving the it's really about driving the repeat purchase. You know, I've read stats that say, it's 14 times more likely to. Sell to an existing customer than it is to a new customer. Yeah, right, like, you know, you have an audience you have a captive audience, the transactional or store emails aren't great way to um to take advantage of that captive audience, you know, I read another statistic recently saying that you know, the average sort of successful or established e-commerce business 43 percent of their business comes from repeat purchases. Okay, so yet. Percent of people are spending on top of the funnel Marketing Solutions, like, you know, Facebook ads or Instagram ads or things like that to get the first the first purchase in but they're often not focusing on how do we get those customers that have purchased to purchase again and again and again, whether that's through transactional emails a loyalty program something else, but it certainly, you know a good strategy to implement. Yeah, definitely. And with the regards to these transactional emails, I know people will think you know, those are definitely some quick wins some easy quick and easy things they can do to try to take advantage of those transactional emails if they're not doing anything special right now. And as far as kind of doing other things, I know, you know, I've heard different things as far as kind of the do's and don'ts what would you say are some things that a company should avoid with regards to the transactional emails certainly keep the. No information in there because that's most important, you know, add some marketing content in there. But at it sparingly, you know, there's no need to to make it, you know a newsletter with 10 different sections, you know have one or two marketing things in there. Maybe have some product recommendations and a discount code, you know include your logo and branding and stuff like that and don't overdo it I'd say, you know, that's one piece of advice. Okay. Great. Yeah, I guess. Key thing you don't want to overdo it and you know be too salesy when the of course the main reason for the email is the transactional information order details. So you don't want to you don't want to overwhelm them or have them have to dig around just to find the track the tracking information. So that that totally totally makes sense. Now, I've seen a lot of transactional Team helps, of course because I first a lot of different things online and you mentioned some things early at the beginning where you know, a lot of companies that aren't taking advantage. You know could be just using maybe just some plain standard emails that don't carry their branding all the way through but if a company doesn't really but say have anything that has their brand or as anyting graphical. It's just kind of a standard texting email. How much would you say the graphics really matter when customizing these transactional emails. Is it going to really make a difference or what's your opinion on that? Yeah, you know, I think I think it makes it fun and engaging. They're sort of that customer experience is sort of hard to quantify that side of things. But you know when you get a plain text email you're like, okay, whatever. It's like anyone sending you an email. But if you add some personality to it from the brand, it can really shine through because you know everyone like I said is opening it. So, you know to have that drop-off and experience doesn't make sense. So whatever you can do whether it's you know, the copy Graphics anyting to sort of represent your brand. You know make sense. Yeah, that's that's totally for sure. You know, one of the things that I always like to pick the brains of our guests on is, you know, you've been with your business for quite some time now and you have kind of been in the trenches. I know and you guys deal with a lot of e-commerce businesses from looking at the grand scheme of things. I always like to give a quick win to one of our customers doesn't necessary have to be related to what you're doing or transactional emails. But what's one thing that. You know an e-commerce business can do right now to help their business grow get more traffic it gets sales, you know today in your opinion. That's kind of a something they can do immediately, you know, just staying on topic. I mean, there's a bunch of things but staying on topic, you know, just spruce up those stories emails you send them every day. Your customers are getting them every day. They they're very likely to engage with them. So if you can add a logo. Some marketing content, whatever your business goals may be atom in a tasteful way to those emails and you know, I can promise you will see results. I mean we've seen just last year alone well over a hundred million dollars in repeat purchases through transactional emails. So it's sort of tried true and tested. So if you can do that, I definitely look for a solution to do something like that. Okay. That sounds awesome and what I always. I can tell from just kind of hearing what you're saying about the transactional emails. It's you know in a way because of the incredible open rate and you know in specially these days that people are so inundated by emails with open rate. Like you said that can be well over 80 percent open rate, which is that's astounding these days if you're not taking advantage of it, you really kind of leaving some some bread on the table and I'm not taking advantage of every single opportunity. So yeah, that's that's for sure. And the other thing there is. Like it's not a Time intensive thing. Right? It's like part of your regular everyday business processes. So just by improving them you can sort of set them and forget them and they go out on their own every single day. So it's not something that requires a ton of attention just set it up once if you want to improve it on a monthly or quarterly basis basis, you know, that's great, but you don't even necessarily have to so that's that's definitely true. Well great Vincent, I definitely appreciate you joining us here in the on the podcast the your feedback and information about the transactional emails is I think will be a benefit to all of our listeners. Now if any of our listeners want to get in touch with you find out more about what you do, how can they do? Sure. Yeah, so they can reach out to me directly at Vincent @ spentlyhq. They can find us in the Shopify App Store, uh the spent app at least and I'll share a URL with you. I'd like to offer a promotion sort of an exclusive promotion for listeners of this podcast. So two months free on any Premium plan in the span lap, as long as you're on the Shopify platform. Okay, great. That's awesome. I know at least listeners will appreciate it and the listeners can look forward to. In that link once the podcast is published. Well, thanks again Vincent. We appreciate you joining us here, and you have a great rest of your day. Thanks so much Harlan great speaking with you. Thank you for listening to the e-commerce marketing podcast to access Ecommerce videos and other resources to help your business. Grow. Please visit get forward slash videos subscribe to us on iTunes by searching for e-commerce marketing podcast, and please leave a rating and a review Thanks for.